dnsmasq is a very lightweight and simple DNS server. dnsmasq can be configured to be a DNS server and a DHCP server. 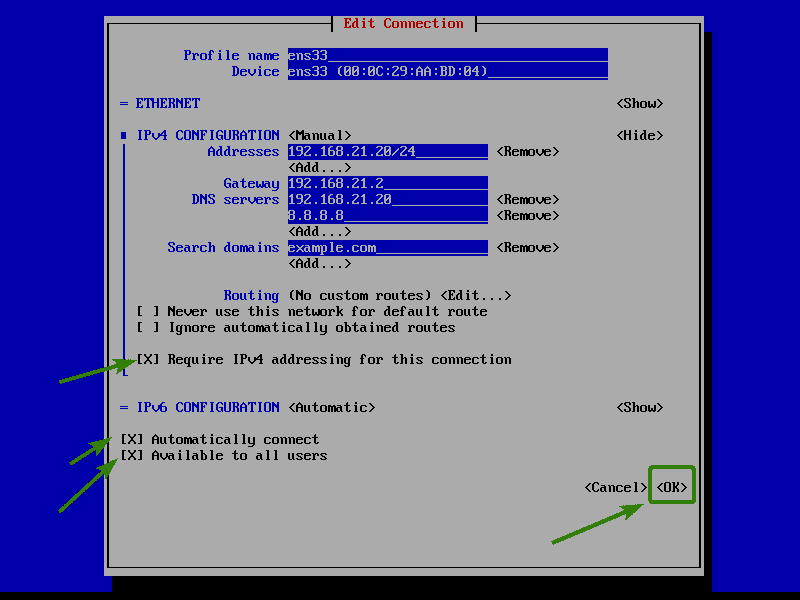 In this article, I am going to show you how to configure dnsmasq DNS server on CentOS 7. I am also going to talk about some of the common DNS server configuration options of dnsmasq. So, let’s get started. First, you have to set up a static IP address on your CentOS 7 machine. You can do that via Network Manager Text User Interface nmtui. 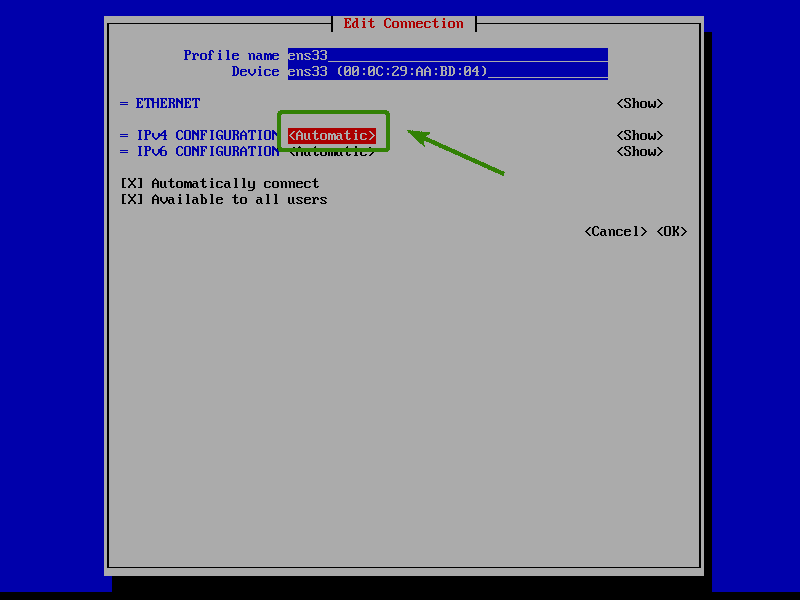 Now, select Automatic from the IPv4 CONFIGURATION section and press <Enter>. Now, navigate to <Show> and press <Enter>. 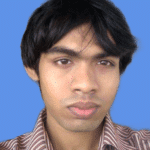 Now, you have to add the IP address, Gateway, DNS server address and search domain. The address should be the IP address of your CentOS 7 machine. This will be the IP address of your DNS server as well once you configure dnsmasq. The gateway is the IP address of your router. Use the IP address that you’re setting for your CentOS 7 machine as the primary DNS server. Then, I prefer adding 8.8.8.8 (Google’s public DNS server) as the secondary DNS server. The search domain should be your own domain name. Once you’re done, make sure all of the marked options are checked. You can select the options and press <Space Bar> to check them if they are not checked already. Then, navigate to <OK> and press <Enter>. Once your computer boots, the IP address should be set as you can see in the screenshot below. Dnsmasq is available in the official package repository of CentOS 7. So, you can easily install it with the YUM package manager. Press y and then press <Enter> to accept the GPG key of the CentOS 7 repository as well. The default dnsmasq configuration file is /etc/dnsmasq.conf. This file contains all the supported options of dnsmasq and well documented. But, it’s very long and hard to work with. So, I am going to rename this file to /etc/dnsmasq.conf.bk and create a new configuration file /etc/dnsmasq.conf. That way, whenever I need any help, I can just look at the file /etc/dnsmasq.con.bk and type in the required options in the /etc/dnsmasq.conf file. Now, press i to go to the INSERT mode of vi and type in the following lines. Then press <Esc>. Finally, type in :wq! and press <Enter> to save the file. Here, port is used to set the port (53 in this article) that dnsmasq will listen to. domain is your own domain name. I’ve used example.com in this article. Now, you can add new DNS entries to dnsmasq very easily using the /etc/hosts file. Now, type in the following lines at the end of the file and save the file. Here, you have a DNS entry in each line. Each line contains an IP address and a hostname separated by tabs or spaces. You type in the IP address first and then the hostname. Now, restart the dnsmasq service for the changes to take effect. Now, you can use dig to test whether the DNS server is working or not. As you can see, the IP address of the DNS name is printed. So, it’s working. 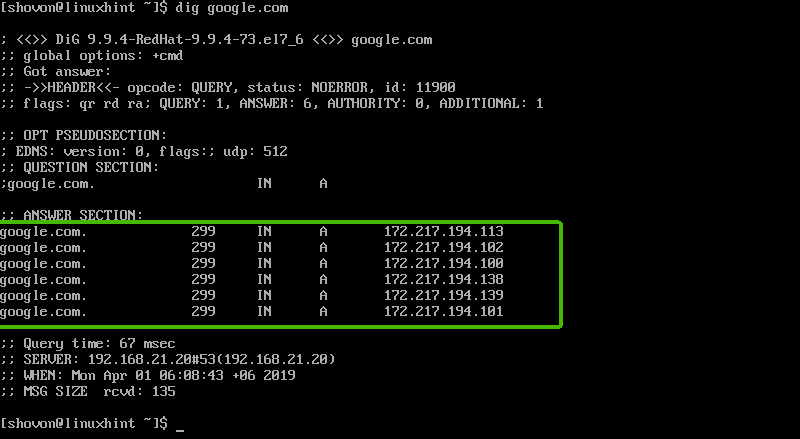 As you can see, the IP addresses of the DNS name google.com is printed on the screen. So, DNS caching is working as well. I’ve shown you a very basic dnsmasq configuration above. But there are some other common options that you can use to configure dnsmasq. In this section, we are going to take a look at them. user and group – You can use these options to set a run user and group for dnsmasq. cache-size – If you want to increase the number of DNS records that will be cached by the dnsmasq server, then use this option. 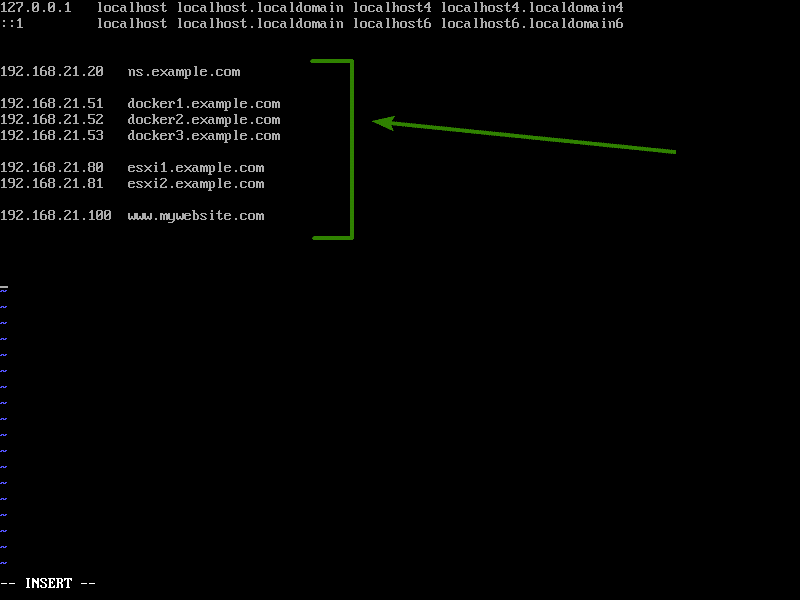 addn-hosts – Earlier, I used the default /etc/hosts file to add new DNS entries. But, if you want to use different hosts file for different domain names, then this option is useful for you. resolv-file – By default dnsmasq uses the /etc/resolv.conf file to learn about what DNS servers to use for name caching. But if you want dnsmasq to get this information from some other file, just create the file, add DNS servers to that file and finally add resolv-file option to your dnsmasq configuration file /etc/dnsmasq.conf. 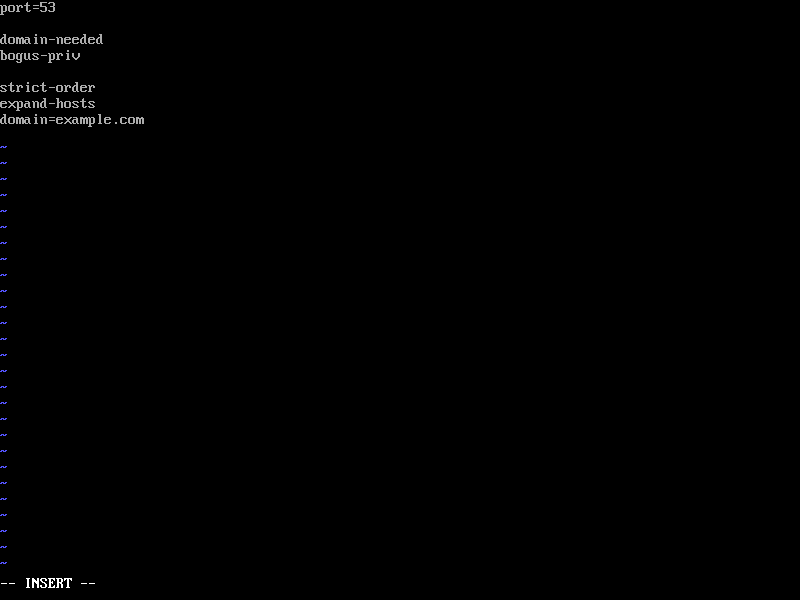 Now, add your DNS servers there in the following format. Remember to put the high priority ones above others. Then, add the following line to the /etc/dnsmasq.conf file. There are many more options of dnsmasq. I recommend you check the default configuration of dnsmasq that you renamed to /etc/dnsmasq.conf.bk earlier for more information. So, that’s how you configure dnsmasq DNS server on CentOS 7. Thanks for reading this article.